It only makes sense that I follow up one of the most unique and original heist movies I’ve seen in years, that being Bart Layton’s American Animals, with one of the most routine and standard heist movies I’ve seen in years, this one being James Marsh’s King of Thieves. Marsh’s film has enough going for it, from a cast made up of respectable acting thespians to the thrilling real-life story of the 2015 Hatton Garden heist it is based on, but the execution is disappointingly clunky with a script that never springs to life as much as it should, and direction that feels so rote and mechanical that it doesn’t even stand out as a stylish throwback to the classic heist movies of old; in short, this is a sorely missed opportunity for something truly special. In case you have no memory of the news from 2015, the Hatton Garden jewellery safe deposit was broken into over Easter weekend, with millions of pounds’ worth of gold, jewels and money stolen in what has been described as the largest burglary in legal history. The film focuses on the group of old men who pulled it off, with recently-widowed ringleader Brian Reader (Michael Caine) rounding up his elderly crew including Terry Perkins (Jim Broadbent), John “Kenny” Collins (Tom Courtenay), Danny Jones (Ray Winstone), Carl Wood (Paul Whitehouse) and Billy “The Fish” Lincoln (Michael Gambon), to break in to the vault. Also joining them is the enigmatic mastermind of the whole thing, a younger man known as Basil (Charlie Cox) who instigates the operation and serves as a fresher pair of eyes on everything leading up to and following the heist itself. It’s a fascinating real-life story, especially for anyone who remembers when the news broke and was all that dominated the headlines for weeks (i.e. probably most of you), and I certainly recall things getting even more interesting when the thieves were caught and revealed to be old men, because who could have predicted that the culprits were people with a combined age of 448? A just-as-compelling film about these events can be made, but King of Thieves is not it; the film very much sticks to a formulaic heist movie template, much to its detriment because it quickly settles into a dull and predictable routine that never sets itself apart from any other heist movie ever made. There’s nothing unique to how it’s shot, directed, written, or even acted that makes it stand out; it all feels so cookie-cutter for a story that really does lend itself many possibilities on the big screen, yet the filmmakers here take advantage of none of that. You’re sat there mostly feeling bored, not necessarily because you know going in how this story is going to end, but largely because the film is barely doing anything to entertain the audience on its own merits, including a script that never bounces off the page into something truly cinematic, and characters who are written just so that they can be tailor-made for actors like Michael Caine to easily slip into. Though the actors all do a fine job, the parts they are given to play here really are just very exaggerated versions of roles they are best known for; for instance, Ray Winstone is playing the same kind of abrasive and thuggish sort we’ve seen him play many times over, while Tom Courtenay gets saddled with the role of a dopey and wide-eyed curmudgeon which he honestly did much better in The Guernsey Literary and Potato Peel Pie Society. I haven’t even mentioned Michael Gambon’s character yet; all you need to know is that his very first scene is of him urinating in a sink for no good reason, and his incontinence seems to be his main character trait throughout the whole movie. None of these actors are given solid enough material to make work, because the script doesn’t dig deep into why these people are motivated to pull off such a crime in the first place – although Cox’s character is largely an invention, his reasons for wanting to rob the vault, not to mention how he has access to it all in the first place, remain irritatingly confidential and make him seem like the most easily persuaded charlatan in criminal history – nor does it provide any real thrills or suspense because you’re not really enjoying being around these characters and are waiting desperately for them to get caught by the police. With a director like James Marsh on board, who had previously brought life and joy to big-screen stories like Man on Wire, Project Nim and The Theory of Everything, the fact that King of Thieves is extraordinarily unstylish and bland-looking is all the more shocking and disappointing. There are parts when you can tell that he and the editor are trying to inject some kind of quirky documentarian pizzazz into its veins, including a funky and smooth soundtrack to clips of older movies spliced in (among them clips of actual movies that the likes of Caine, Courtenay, Winstone et al starred in during their younger years), but there’s nothing as snappy or intriguing in the script that matches what Marsh was clearly going for with this film, and that sadly makes all the difference. I still think there could be a really fascinating film that could be made about the Hatton Garden heist, which takes into account not just the old men that nearly pulled it off but also the fact that several people ended up losing millions in the process, and that the Hatton Garden Safe Deposit Company even closed its doors shortly after due to bad business because of it, but King of Thieves disappointingly does very little with a story that’s truly larger than life. 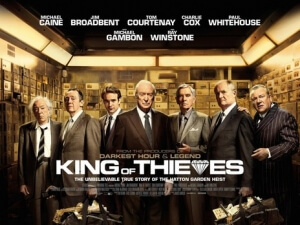 King of Thieves is a disappointingly rote retelling of the famous Hatton Garden heist which contains a script that fatefully sticks to formula and doesn’t explore many of the fascinating elements of the story, instead giving us a dull and unstylish heist movie with very little of the thrills that the real-life tale actually inspired.